The Arizona Geological Survey is monitoring a 2-mile long crack that has opened up in the Arizona desert. Recent drone flights over the crack reveal that it has continued to grow both in length and width in Pinal County, to the southeast of Phoenix. Scientists are actively monitoring the crack and took drone video of the extent of the fissure as normal documentation of an area prone to large cracks in the Earth. The northern portion of the crack is older and partially filled in by eroding sediment and from collapse of the crack’s edges. Meanwhile, the southern portion remains 25 to 30 feet deep and 10 feet across. The fissure tapers out toward each edge but the southern edge continues to grow in length and widen. The crack was first noticed in 2014 during a review of Google Earth images across the landscape to look for abnormal features. This prompted the Arizona Geological Survey to visit the site and measure the length, width, and depth of the massive fissure. They noticed the size was significantly larger than what appeared in the Google Earth imagery and had grown to almost 2 miles long. 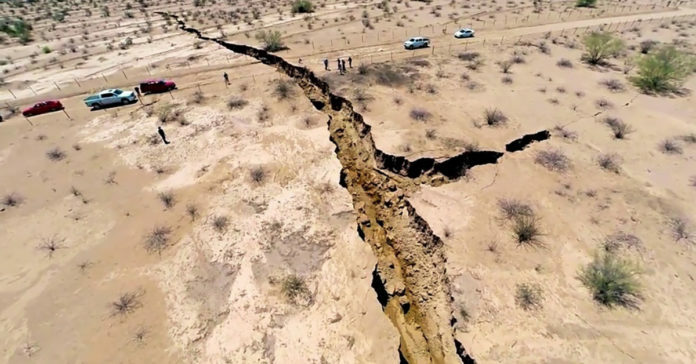 The crack had grown significantly due to local heavy rains that enhanced erosion and collapse of the overlying sediment to reveal the underground fissure. This region of the United States is prone to cracks developed from extensive groundwater usage. Specifically, cracks form along the margins of subsidence areas and along nearby mountain fronts, where more competent rock is not prone to collapse. The Arizona Geological Survey actively measures 26 study areas of fissures and have mapped a combined 170 miles of fissures in the region. Geologists with the Arizona Geological Survey expect the crack to continue to grow at the southern extent. They expect the underground extent of the fissure is significantly larger than the surface expression seen by the drone footage. Thankfully the crack is in the middle of the desert and likely not a harm to humans as long as no one attempts to walk or drive up to the crack. However, the crack could cause harm to local cattle that may use the area for grazing.